The 2014-15 Duck basketball team surprised everyone (me included) with its round of 32 tournament run this past season. 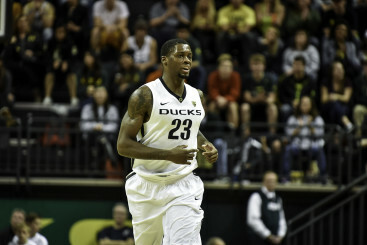 The Ducks overcame substantial adversity after losing key starters and role players from the 2013-14 season in Jonathan Lloyd, Mike Moser, and Jason Calliste via graduation and sophomores Dominic Artis and Damyean Dotson via dismissal from the program. What Coach Altman achieved this last season — with the adversity the program faced in the offseason and the lack of experience on the opening day roster — is nothing short of amazing, rightfully earning Altman PAC-12 Coach of The Year honors. Although the star of the team, Joe Young, and his 20.7 points per game are leaving for the NBA, the Ducks are blessed with a myriad of young talent that should make this team competitive for years to come. 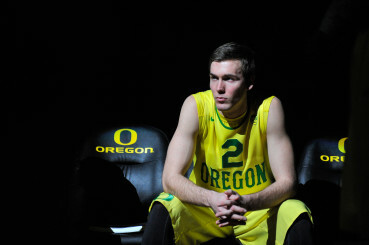 Casey Benson waits to hear is name called as the Ducks take on bitter rival, Oregon State. Casey Benson and Ahmaad Rorie stepped up and played well in the absence of Artis and Lloyd, locking down the point guard position and freeing up Joe Young to shoot the lights out and carry the Ducks to the Tournament. Between the two of them, there was not a clear-cut starter as Coach Altman used them to platoon the position, with Benson and Rorie averaging 19.6 and 18.8 minutes respectively. Heading into the 2015 season, look for Benson to edge out Rorie as the opening day starter simply because Benson was the more the sure handed point, averaging slightly more assists and less turnovers per game than Rorie. However, Altman will likely employ the same platoon strategy as last season with the two guards, as well as some contribution from ESPN Top 100 recruit Kendall Small. Nobody is going to be able to step in right away and replace the PAC-12 Player of The Year, Joe Young, and his 20.7 points per game. But the Ducks need to move on from the Young era, and the best way to do that is by starting the explosive Tyler Dorsey at the 2. Dorsey is a talented scorer and our top recruit from this incoming class, garnering a top-40 ranking in the ESPN Top 100. At one point during his final high school season, the 6’4 guard out of Los Angeles, CA put up 40, 40, and 36 points in 3 consecutive games. That type of streaky scoring is what helped make Young as successful as he was during his two-year stint with the Ducks. 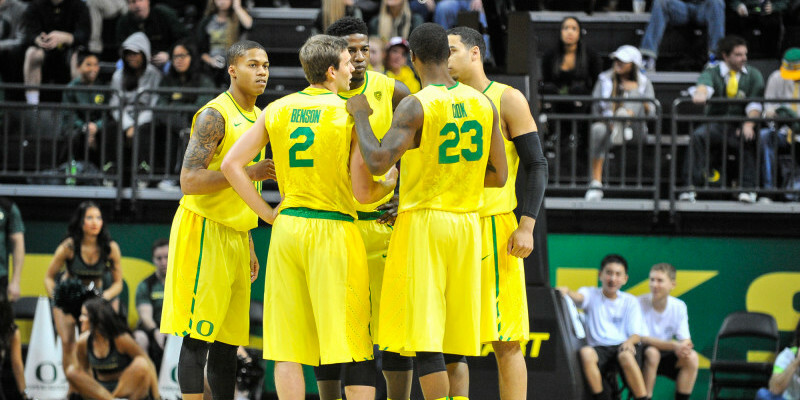 Oregon is going to need that kind of shooting threat at the two if they are going to thrive in the post-Young era. If you don’t believe me, take a look at some of his best work from the NBA Top 100 camp that Dorsey took part in this last winter. Starting Dorsey at shooting guard not only puts a strong shooter on the floor, but also allows Dillon Brooks to play his natural position at small forward. Brooks, who was a 4-star recruit out of high school, was a stud during his freshman campaign. He was the Ducks’ third leading score with 11.5 points per game and was named to the PAC-12 All Freshman team at the end of the season. With Joe Young’s 592 shot attempts now up for grabs, look for Brooks to be one of the Ducks primary scoring options on offense. The future looks bright for this versatile forward as he enters his sophomore season for the Ducks as one of the new leaders of the team. Elgin Cook jogs back on defense as the Ducks defeat Northwest Christian University in their season opener. When the Ducks take the court to open the 2015 season, Elgin Cook will be the most experienced player on the roster and a valuable asset to Coach Altman. Cook will be entering his third and final year for the Ducks after signing as a highly touted JUCO prospect out of Florida. Having this kind of veteran experience will be crucial to the Ducks success in 2015 considering the amount of underclassmen in the starting line-up alone. Not to mention Cook was the second leading scorer, third leading rebounder and was tied for first in steals with 13 PPG, 5.2 RPG, and 1.1 SPG respectively; earning him Second Team All PAC-12 honors at the end of the regular season. Cook is an all around solid basketball player whose high basketball I.Q. 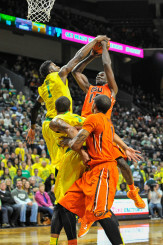 and veteran leadership will help propel the Ducks toward another run in the NCAA Tournament. Jordan Bell rejects another shot, adding to his record breaking block total. Jordan Bell was the second member of the Ducks freshman one-two punch last year along with Dillon Brooks. While Brooks is the more offensively talented of the two, Bell proved to be a lock down defender and the best shot blocker in school history after breaking the school single season record for blocks during his freshman campaign. Bell led the Ducks in rebounds with 6.1 per game, and blocks with 2.7 per game and joined Brooks on the PAC-12 All Freshman Team but was the only Duck named to the PAC-12 All Defensive Team. Which is not surprising in the least, given he led the conference in blocks last season and is now ranked 5th in PAC-12 history with his 94 blocks in a single season. Bell is a lock as a starter next year and looks to be the Ducks new paint protector for years to come.